The ceremony has ended, the last cocktails are being sipped, and guests are entering the dining room. What will help set the mood? Let the current season guide the motif of the table place settings. Every season offers an element that can become personalized for your taste. The outdoorsy vibe that summertime offers can be replicated indoors with the right lighting and earthy arrangements. Centerpieces with summertime flowers can consist of poppies, sunflowers, carnations, dahlias, garden roses, and chrysanthemums. Wood-colored china ties the table together with an olive napkin, to give a full garden feel. 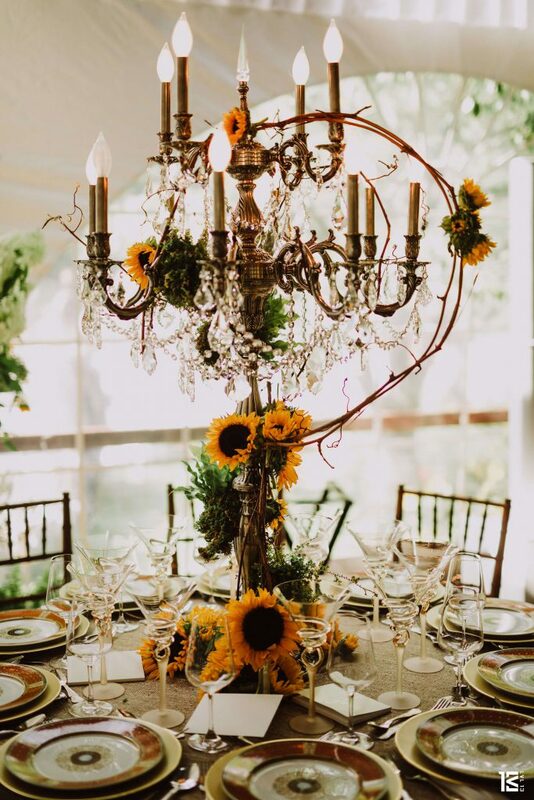 Lighting each table is imperative, but have some fun with your light-based centerpiece- whether it be a candelabra, a gathering of tea candles, or a vintage-style lamp. Citrus fruits, like lemons, limes, and oranges add a surprising addition and can be incorporated anywhere on the table. Fall offers warm-color ranges that remind guest of harvest. Pepper your tables with simple decorations like small pumpkins, acorns, pomegranates, grapes, and orange tomatoes. Use these fall fruits and vegetables as name placements to have guests be fully immersed in the season. An alternative is to have a large pumpkin be the centerpiece in place of flowers, and complete the fall décor by surrounding each plate with its own leaf arrangements. During the winter months, snow usually comes to mind first. However, if the décor is already saturated with white, then consider strong contrasts that dark colors and white dishes offer. 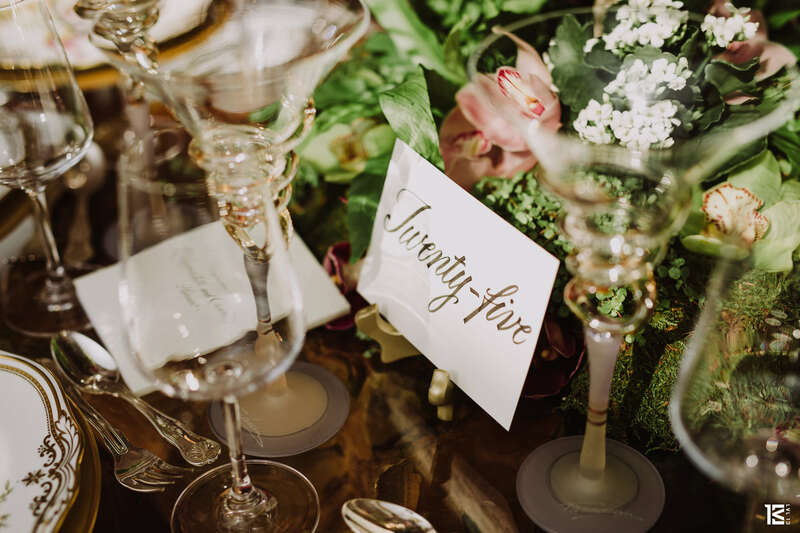 White brimmed pinecones with hand-written table numbers add a simple, subtle flare. Be careful not to overload a clean-styled table with too many bold colors. Two or three striking cohesive pieces spread evenly and throughout the table, a snowflake napkin holder and a snow globe name placement, make for a minimalistic on-theme table. Spring delivers a joie de vivre with playful colors and flower blossoming. 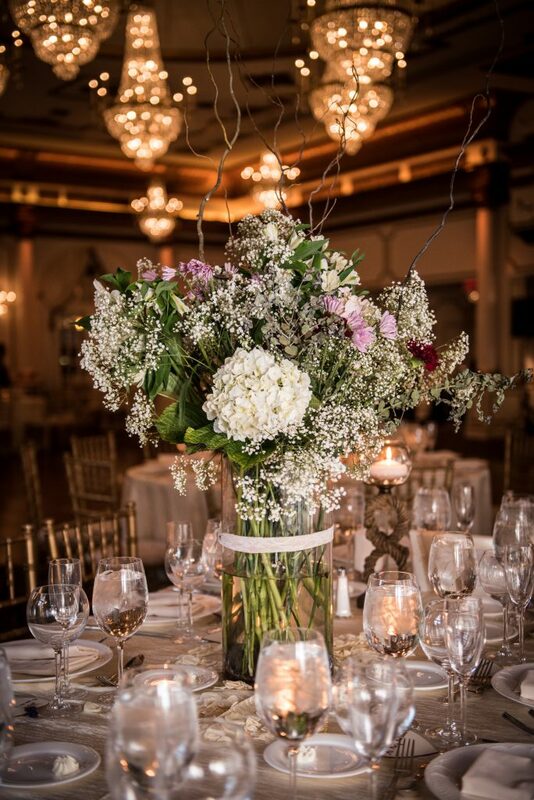 To avoid going overboard with floral decor, large floral arrangements centerpieces accompanied with plain, elegant plate wear can give a lasting impression. A taller vase – which lends to a high flower placement – makes conversation between guests easy, allowing for a visually beautiful table without obstructing views. Remember, when planning the table place setting; first determine your favorite aspect of the season. It can start with a color, aroma, or item. Then, pick out the related elements to those aspects that you love. The subtle incorporation of those elements will not go unnoticed, and your guests will be talking about your table expressions for weeks after. Follow us on Facebook, Twitter, and Instagram for more wedding inspiration. Header photo courtesy of LVL13.